This vegan paella is made with tender saffron-infused rice, veggies, and mix of savory mushrooms. Paella is pronounced “pie-ay-ah.” I just learned that recently. In fact, I’d been going around thinking it was pronounced pay-ella and that “pie-ay-ah” was a completely different thing. 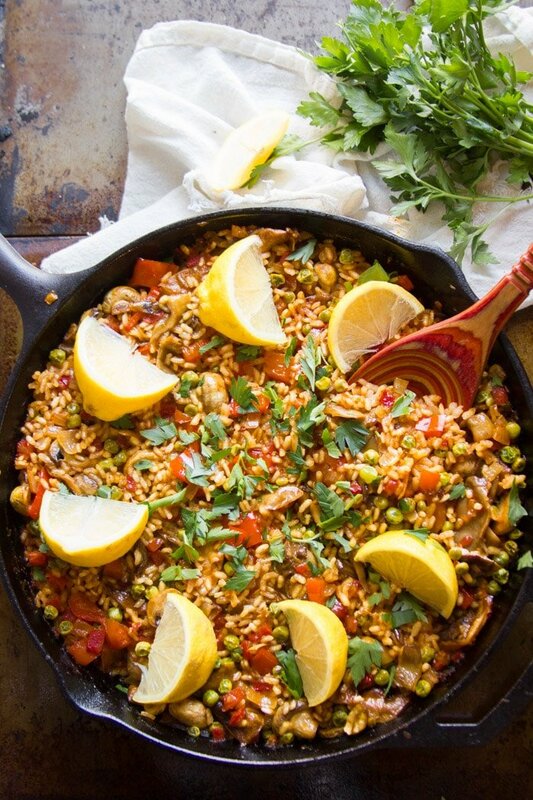 No really, like, I’d see these pictures or paella on Pinterest and think, “Oh look at that lovely rice dish. I should make a vegan version of that.” And then people would talk to me about how much they loved “pie-ay-ah,” and I’d think it was some pie thing. I knew it was spanish and involved seafood, but not much else. I think I tuned out after the seafood part. Anyway, my brother was telling me about the awesome mushroom “pie-ay-ah” at a vegetarian restaurant he visited, and I was all, “Oh, do tell! A big Spanish mushroom pie thingy" Vegan" That sounds awesome!” Okay, so did you follow all that" They’re really just one dish and it’s Spanish and involves rice and, traditionally, seafood. No pie. That’s okay! Pie has it’s place, but it’s not everything. There’s room for rice in my heart too. So I eventually visited the vegetarian place and had a taste of their vegan paella and decided to copy them.